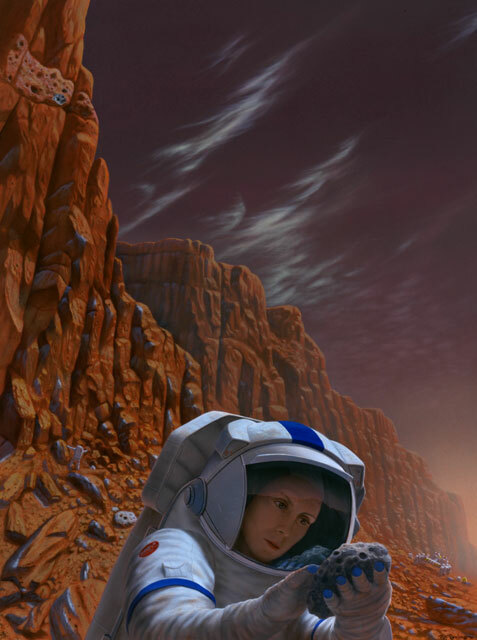 Confirmation of the existence and extent of life on Mars, whether ancient or current, will benefit human exploration. Here an exobiologist examines what appears to be a porous relic of a hot spring that has fallen from the canyon wall. Such samples could provide the first on-site, fossilized evidence of Martian life forms. Confirmation of the existence of life on Mars, whether ancient or current, will probably require human exploration. Here an exobiologist examines what appears to be a porous relic of a hot spring that has fallen from the canyon wall. Such samples could provide the first on-site, fossilized evidence of Martian life forms.